Pennsylvania's State Transportation Innovation Council has several success stories to brag about, including deployment of warm-mix asphalt, geosynthetic reinforced soil integrated bridge systems and the Safety EdgeSM. But a clear benefit of the group, according to Pennsylvania Transportation Secretary Barry Schoch, is that it shows taxpayers the highway agency and its stakeholders are working aggressively to use tax dollars efficiently and apply new technologies to improve the transportation system. “That in itself is worth the effort of the STIC,” he said. Schoch told the story of the development of Pennsylvania's STIC during a fall 2013 virtual conference organized by the Federal Highway Administration to talk about the STIC initiative and announce a new incentive program to help the state-based groups deploy innovations. STICs—led by the highway agency head and FHWA division administrator in each state—bring together transportation stakeholders to identify and implement innovations, including those promoted through FHWA's Every Day Counts initiative. All 50 states, the District of Columbia and Puerto Rico have STICS in some format. The Pennsylvania Department of Transportation launched its STIC in 2010 as part of its Next Generation initiative to modernize its processes and technologies. STIC members include representatives from transportation associations, state and local government agencies, environmental and historical preservation groups and academia. The STIC meets quarterly to discuss potential innovations and deployment plans. In addition to its leadership group, the STIC has 10 technical advisory groups on project delivery, construction, maintenance, design, environment, safety, technology, intelligent transportation systems, materials and public outreach. The advisory groups evaluate innovations and develop white papers on benefits and impacts for STIC leaders to review. The agency built five bridges with GRS-IBS technology in 2013, which reduces costs and construction time, and has at least three planned for 2014. It's marketing the innovation to local governments with a traveling tabletop GRS model (see “GRS Model Helps Deploy Innovation”). “We want to increase awareness that this technology can be very cost-effective, deliver projects quickly and allow local government to participate with man hours and equipment to help build them,” he said. The Pennsylvania DOT used the Safety EdgeSM paving technique on 77 projects last year to make it easier for vehicles that drift off the road to return to the driving lane safely. “We hope that by using innovations such as warm-mix asphalt, GRS bridges and the Safety EdgeSM we can illustrate to the public that these ideas don't merely go into the bureaucratic black hole of government,” Schoch said. All told, Pennsylvania's STIC is implementing 17 of the innovations on FHWA's Every Day Counts roster, as well as 18 additional innovations the group has identified. “The STIC in Pennsylvania is a good success story, but we're just getting started,” Schoch said. One way FHWA is supporting state efforts to deploy innovations is through the STIC Incentive Program announced during the webinar. Under the program, each STIC can obtain up to $100,000 per year to support its innovation efforts under the Every Day Counts initiative. The funds can be used for activities to make innovations standard practice in a state, such as developing technical guidance and standards, implementing process changes, organizing peer exchanges and delivering training. “They can support some of the things that need to happen to deploy innovation effectively,” said FHWA Executive Director Jeffrey Paniati. For information on applying for a STIC incentive, contact the FHWA division office in your state at Federal-Aid Division Offices. 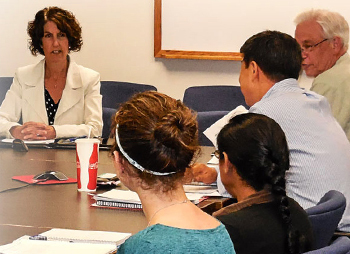 When California Department of Transportation staff wanted to explore programs to certify local agencies to build Federal-Aid Highway Program projects, they got together with their Washington State counterparts to learn how they do it. During a three-day peer exchange, the California team met with Federal Highway Administration and Washington State DOT experts to discuss the process of administering local agency projects from cradle to grave, with an emphasis on certification programs. They also talked with representatives of local agencies and metropolitan planning organizations about their experiences with Federal-Aid projects. FHWA hosted the event at its Washington Division office in Olympia. Certification programs are one of the strategies FHWA is recommending in its Every Day Counts effort to help states administer local Federal-Aid projects. Through certification programs, state agencies confirm that local agencies have the ability to manage all or part of the project development and implementation process themselves. They enable states to delegate responsibilities under the Federal-Aid program and allow certified local agencies to manage their own projects, saving time and money. The FHWA team helping states learn about local agency certification includes Sharon Gordon of the Arizona Division, Megan Hall of the Washington Division and Jorismar Torres-Hernandez of the DelMar Division. One of the tools they're using is peer exchanges between states interested in setting up certification programs and champion states with experience doing it. The champion states—Missouri, Oregon, South Carolina and Washington—develop materials for the visiting team to review before the exchange, help set an agenda that addresses the visitors' interests, and make experts in various aspects of local project administration available during the exchange to share their knowledge. Benefits of the peer exchange approach include the opportunity to learn firsthand how states handle certification and project administration issues, Hall said, as well as to participate in in-depth discussions on the topics the visiting team wants to learn about. Exchanges also allow the teams to develop a working relationship that extends beyond the initial meeting. Start with an analysis of the agency's risks, needs and resources for local agency certification and the type of certification program the agency wants. Options include a local public agency-administered program, a tiered approach in which local agencies can become certified in certain areas of Federal-Aid project delivery, a project-specific approach and individual certification training. Commit to launching a certification program. Contact the state's FHWA division office for assistance in arranging an exchange, allowing sufficient time for scheduling and planning. Some funding is available to help with event costs, Hall said. Review available information on certification programs, determine what topics are most relevant to the state's needs and list questions that can be used to build an agenda. Determine who should participate in the exchange. “You want to make sure you have the right people in the room,” Hall said. Read meeting materials in advance to get the most out of the event. Plan on a peer exchange of at least two days to allow time to cover agenda topics thoroughly, Hall said. Peer exchanges can include video conferencing for some participants to limit travel costs and time, she added. Since its peer exchange with the Washington State DOT, the California team has been reviewing what it learned about local agency certification and determining next steps. The FHWA team, meanwhile, anticipates helping several other states plan peer exchanges in 2014. A peer exchange brought staff from Washington State's and California's highway agencies together to talk about locally administered Federal-Aid projects. FHWA is offering a series of free webinars to help agencies and other transportation stakeholders adopt 3-D models for construction. The first webinar, “Overview of 3-D Engineered Models for Construction,” was held in November 2013. For information on the webinars, contact Douglas Townes at (404) 562-3914 or douglas.townes@dot.gov. To learn more about 3-D modeling for construction, go to 3D Engineered Models for Construction. The use of three-dimensional models of highways has taken a firm foothold in modern transportation construction. The technology, part of the Federal Highway Administration's Every Day Counts initiative to deploy innovation, allows for faster, more accurate and more efficient project planning and construction. As the benefits are more widely recognized, many in the U.S. highway industry are making the transition to using 3-D mode over the traditional two-dimensional design process. Fundamentally, 3-D modeling is the use of a collection of intelligent computer objects that represent an original surface, in this case the design surface of a highway segment. The objects know their position in space and in some cases what they represent. With 3-D modeling software, design and construction teams can connect virtually to develop, test and alter project designs throughout the design and construction phases. Design features can be viewed geospatially, or in a 3-D view, from multiple perspectives, and simulations can be run to detect design flaws before construction begins. Data exported from 3-D models can be transferred to construction equipment, like bulldozers, excavators, pavers and rotomills, with automated machine guidance controls that significantly improve productivity. Equipment operators can compare design grades to their current grade by using a computer display in the cab, an innovation that saves time and rework. Contractors estimate as much as a 15 to 30 percent increase in productivity. California Department of Transportation conducted a survey of state highway agency practices with 3-D modeling. Eighteen state transportation departments responded to the 2012 survey. Nearly three-fourths of the respondents are now using advanced modeling, and most modeling began in the middle to late part of the 2000–2010 decade. Several DOTs have or are now implementing 3-D modeling programs. According to the survey, Maryland, Washington and Wisconsin are the only states using four-dimensional models that add the dimension of time (construction scheduling) to spatially based 3-D models. 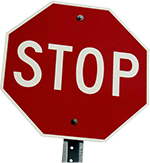 In Wisconsin, 4-D modeling is not mandatory, but is at the discretion of project staff. Washington uses 4-D models for visualization purposes only. Washington models may also reflect other project considerations, such as construction staging, emergency design alternatives (such as flooding and earthquakes) and historic narration. Agencies are using advanced modeling techniques for reconstruction and grading projects as well as intersection improvements, culvert replacements, storm sewer and drainage improvements and bridge replacements. Most respondents reported that contractors are using 3-D models for automated machine guidance. Survey respondents cited a range of benefits associated with modeling, although for the most part they were unable to quantify them. Time savings: Visualization leads to faster decision making, profiling is simpler and faster calculations for earthwork can be generated, more iterations of designs can be developed more quickly, and problems are spotted more easily and corrected earlier in the design process. Cost savings: Using modeling can result in lower bids, lower survey costs, less rework, more accurate estimates, and fewer change orders and field modifications. Quality: It provides the ability to catch avoidable mistakes, earthwork calculations are more representative of the proposed project and conflicts can be resolved before the bid process begins. Customer relations enhancements: It builds belief in the design and confidence in the engineer-client relationship. A tabletop model is showing Pennsylvania audiences how geosynthetic reinforced soils can improve the way bridges are built. The geosynthetic reinforced soil integrated bridge system, a Federal Highway Administration Every Day Counts innovation, uses geosynthetic reinforcement and granular soils as a composite material to build abutments and approach embankments that are less likely to settle and create a bump at the end of the bridge. The GRS-IBS is easy to build and maintain and more cost-effective than conventional construction methods. The Pennsylvania Department of Transportation, FHWA Pennsylvania Division and Pennsylvania State University combined forces to create the GRS model. Its main use is for training sessions on the technology, but it's also making the rounds of transportation events and conferences throughout the state. Built with lightweight materials, the model is easy to assemble and disassemble. When taken apart, it's small enough to fit in a car. The model debuted at the September 2013 meeting of the Pennsylvania State Transportation Innovation Council before heading into a series of training sessions. It was also displayed at the Associated Pennsylvania Constructors Fall Seminar. Designed and built by Steve Bloser and Eric Nevel at Penn State's Larson Transportation Institute, the model clearly depicts the simple technology used in the geosynthetic reinforced soil bridge abutments, said Karyn Vandervoort, Every Day Counts coordinator for FHWA's Pennsylvania Division. “We are expecting more and more bridges to be constructed using this proven time- and cost-saving approach now that the visual tool is available for audiences across Pennsylvania,” she said. 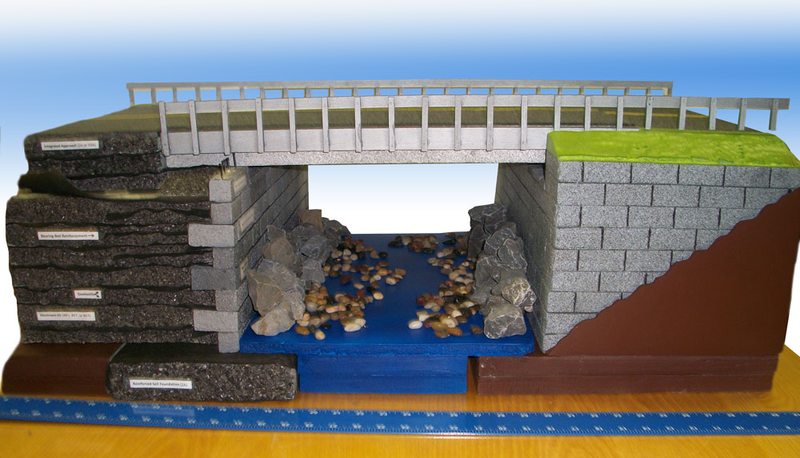 The Pennsylvania DOT is using a traveling tabletop model to demonstrate the benefits of geosynthetic reinforced soils in bridge construction. State highway agencies are trying innovations that are new to them and making them standard practice to better serve travelers and taxpayers. More states are adding diverging diamond interchanges to their highway-building toolkits to enhance safety and traffic flow at busy interchanges. The Minnesota Department of Transportation, for example, opened its first DDI on State Highway 15 in St. Cloud to serve a rapidly developing healthcare campus. The Ohio DOT built its first one at Roberts Road and I-270 in Columbus to handle the area's large traffic volume. The Idaho DOT's first DDI is designed to improve access to I-86 from Yellowstone Avenue in Chubbuck. And the Kansas DOT's first DDI at I-35 and Homestead Lane in Johnson County eliminates the wait for left turns onto the interstate and reduces crash potential. The Rhode Island Department of Transportation worked with the Federal Highway Administration to produce a construction specification for intelligent compaction for asphalt paving. The specification will be field tested as a special provision in a few contracts before it's finalized as a standard specification. The first test is on a $1.4 million mill and overlay project covering about 2.3 miles of roads at five locations around the state: Coventry, East Providence, Narragansett, North Kingstown and West Greenwich. Washington, D.C., Mayor Vincent Gray and other officials joined in an October 2013 ribbon-cutting ceremony to celebrate the completion of the city's largest American Recovery and Reinvestment Act project, the $44 million New York Avenue Bridge rehabilitation. The new bridge, built using a design-build approach, has a 75-year design life and accommodates 87,000 vehicles per day. The Ohio Local Technical Assistance Program held simultaneous sessions in five cities of the December 2013 Every Day Counts Exchange on intersection and interchange geometrics. The events in Akron, Columbus, Lebanon, Lima and Marietta attracted local government agency representatives and others who wanted to learn about using innovation to improve intersection safety and efficiency. They participated in FHWA's national webinar before discussing local action items with colleagues. The Ohio LTAP has scheduled FHWA-led, one-day training sessions on intersection and interchange geometrics in three cities in March. Highway professionals learned about intelligent compaction at a Tennessee Department of Transportation showcase in Lincoln County. The agency is using the technology on several asphalt pavement resurfacing projects to improve pavement stiffness and cut highway repair costs. The event featured a workshop and construction site visit to see intelligent compaction rollers in action. The technology enhances project quality control by increasing uniformity and accelerates construction by providing real-time feedback on compaction. Innovator — the Federal Highway Administration's source for innovation news—will move from a print publication to an all-electronic newsletter in 2014. Readers will be able to view the new Innovator online on their preferred devices as well as download and print a copy. Readers who sign up for the electronic Innovator will receive an email alerting them when the latest issue is available. Going electronic will allow the newsletter to include enhanced content, such as videos, slide shows, 3-D images and links to more detailed information on innovations. It will also save printing and mailing costs and time, enabling FHWA to get the latest innovation news to subscribers faster while minimizing the environmental impacts of paper publication. Make sure you don't miss an issue by signing up for email notifications. Stop by the Center for Accelerating Innovation display at the Transportation Research Board Annual Meeting—January 12–16, 2014, in Washington, D.C.—to see how the Federal Highway Administration is partnering with transportation stakeholders to build highways better, faster and more safely. Experts will be on hand to answer questions and offer information on resources to learn more about the innovative technologies and practices FHWA is promoting through the Every Day Counts initiative. Also make plans to attend the Center for Accelerating Innovation's “Leadership and Innovation” session from 1:30 to 3:15 p.m. on January 13. Speakers include FHWA Administrator Victor Mendez, Utah Department of Transportation Executive Director Carlos Braceras, Pennsylvania Transportation Secretary Barry Schoch and Nokia Vice President Ogi Redzik. FHWA Executive Director Jeff Paniati will moderate. A session on “Legacy and Future of Project Demonstration Showcases” is set for 2 to 4:30 p.m. on January 15. It will look at the past, present and future of demonstration projects, which enable transportation professionals to see innovative construction approaches in action. As a result of these showcases, a variety of innovations have moved into standard use nationally. Speakers include Bruce Seely of Michigan Technological University on the history of demonstration projects, Mary Lou Ralls of Ralls-Newman on how showcases have demonstrated the benefits of accelerated bridge construction, Ewa Flom of FHWA on funding available for showcases and Randy Brown of Applied Research Associates on using game-based learning tools to conduct virtual demonstration projects. Kathleen Bergeron of FHWA will moderate. For more information on the TRB meeting, visit The Transportation Research Board (TRB) 93rd Annual Meeting. When the Wyoming Department of Transportation built its first diverging diamond interchange recently, it cut construction time and costs to about half those of the conventional alternative, estimates Mark Boushele of the Federal Highway Administration's Wyoming Division. The state reworked the Interstate 25/College Drive interchange near Cheyenne for a cost of $4.16 million. Construction time was just nine months, compared to two construction seasons and 18 months of traffic control that a conventional widening of College Drive would have taken, said Boushele. The DDI is one of the innovative interchange and intersection designs FHWA is promoting through the Every Day Counts initiative. And the Wyoming DOT received a grant from FHWA's Highways for LIFE program to try it on the I-25/College Drive project. The DDI's innovative features are in the actual design of the interchange. The traffic is switched to drive on the left side of the structure through reverse curves on each end of the interchange. By moving traffic to the left side of the traveled way as it crosses the structure, left turns to the entrance ramps no longer conflict with the opposing through movement. All left turn movements become a “yield” or “free” condition, allowing signals to be reduced to a two-phase system. “The new DDI significantly reduced delay for vehicles entering and exiting the I-25 freeway at this interchange,” Boushele said. “And it should provide capacity needed for a 20-year time horizon. The main problem at the interchange was left-turning truck movements because there are truck stops on three out of four corners of the interchange. And the interchange also has truck traffic from Interstate 80, which runs about a half-mile north of the new interchange. The conventional alternative to the DDI probably would have been to widen the College Drive bridge and roadway in the area from three lanes to five, Boushele said. That would have required acquiring new right-of-way and would not have addressed the need for truck storage for left turns. But the new DDI eliminates the need to store trucks because they now have free left turns off the bridge, Boushele said. Standards and specifications for the DDI innovation are available and ready to use, as demonstrated by the departments of transportation in Missouri and Utah, which are constructing or have constructed several DDIs. DDIs are now open or being designed or built in Missouri, Tennessee, Utah and more than a dozen other states. The DDI is expected to improve substantially the safety of the College Drive interchange. A study of Missouri's first DDI found a dramatic drop in the crash rate—about 40 percent—and a significant reduction in crash severity. Such reductions can be attributed to the smaller number of vehicular conflict points in the DDI compared to conventional interchanges. Crash data for the College Drive interchange shows that from 2006 to 2010, 38 crashes occurred on College Drive and 34 crashes on I-25 within the study area. On College Drive there were no fatalities, 11 crashes with injuries and 27 property-damage-only crashes. On I-25 there were no fatalities, five crashes with injuries and 29 crashes with property damage only. For more information on intersection and interchange geometrics, visit Intersection and Interchange Geometrics. Wyoming DOT received a grant from FHWA’s Highways for LIFE program to try it on the I-25/College Drive project.